Desert Cowboys are U.S. armed servicemembers who carried the cowboy code into Iraq and Afghanistan. 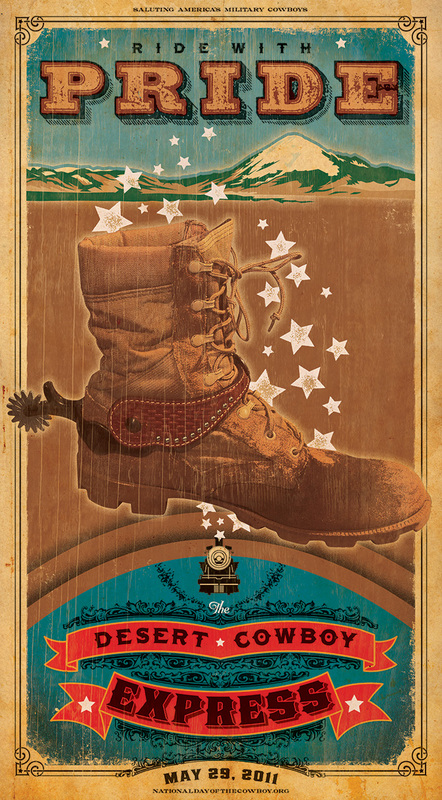 To celebrate them, a special train ride & event was planned by the National Day of the Cowboy organization at La Veta Pass in Colorado. It was my honor to feature the actual combat boots of a good friend and servicemember who served in Iraq. The dark red stains near the toe of the boot are unretouched, original -- and keep the design rooted in the reality of why our armed forces deserve our eternal respect.